Good. Tall hardcover. Sound & good copy, light to moderate edgewear. Jacket has light to moderate rubbing/edgewear, sunning at spine. Not price clipped. May not be available for international shipment at usual rates due to weight/size. Like New. Hardcover and dust jacket. Minimal wear to jacket. Good binding and cover. Clean, unmarked pages. Ships daily. Giotto. Very Good in Good jacket. Religious Clean, bright, crisp and tight. Some shelfwear with a tiny tear Looks good in new mylar. I love this book, but it's out of print. I buy every one I can find for my future grandkids. It is beautiful and sweet. This gem should be reprinted. 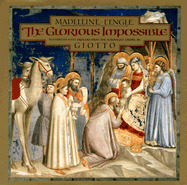 L'Engle's text complements perfectly the splendid reproductions of Giotto's masterpieces.